Detailing the physical features, habits, territorial reach and other identifying qualities of the Wee Harlequin Bug. Though small in stature, the Wee Harlequin Bug has made an entire continent a place to call home. The Wee Harlequin Bug is shaped like shield or armor. A glossy black body has two red spots in the center of its back and a red-rimmed ridge near the head. Its red and black coloring should be sufficient warning to those who might bother it. As a member of the Stink Bug family, it is capable of emitting a repugnant odor when threatened. Its small size may also be part of the reason why this species is so successful; it is difficult to see them. It can be found in all three countries in North America, but it is not known to be a pest in any of them. 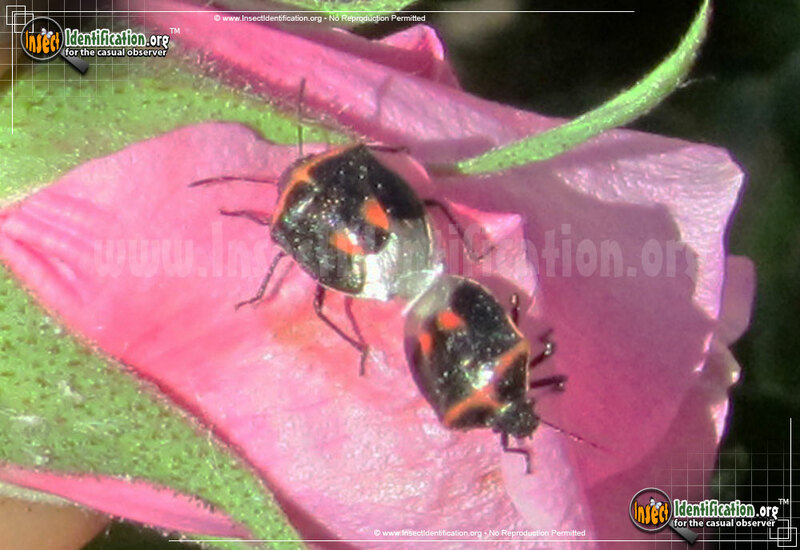 In warm months, expect to find Wee Harlequin Bugs in parks, fields, and meadows where they are visiting flowers and vegetable plants. They particularly like plants in the Verbascum genus. They eat snapdragons, grapes, columbine, and raspberries. Two generations can be produced in the warmer regions of the south, while only one generation is produced in the north.